This article is about the German company. For the French-owned company spun off from the BASF magnetic tape division, see EMTEC. BASF SE is a German chemical company and the largest chemical producer in the world. The BASF Group comprises subsidiaries and joint ventures in more than 80 countries and operates six integrated production sites and 390 other production sites in Europe, Asia, Australia, the Americas and Africa. Its headquarters is located in Ludwigshafen, Germany. BASF has customers in over 190 countries and supplies products to a wide variety of industries. Despite its size and global presence, BASF has received relatively little public attention since it abandoned manufacturing and selling BASF-branded consumer electronics products in the 1990s. At the end of 2017, the company employed around 115,490 people, with over 52,000 in Germany alone. In 2015, BASF posted sales of €70.4 billion and income from operations before special items of about €6.7 billion. The company is currently expanding its international activities with a particular focus on Asia. Between 1990 and 2005, the company invested €5.6 billion in Asia, for example in sites near Nanjing and Shanghai, China and Mangalore, India. BASF is listed on the Frankfurt Stock Exchange, London Stock Exchange, and Zurich Stock Exchange. The company delisted its ADR from the New York Stock Exchange in September 2007. The company is a component of the Euro Stoxx 50 stock market index. BASF is an initialism for Badische Anilin und Soda Fabrik (German for "Baden Aniline and Soda Factory"). It was founded by Friedrich Engelhorn on 6 April 1865 in Mannheim, in the German-speaking country of Baden. Engelhorn had been responsible for setting up a gasworks and street lighting for the town council in 1861. The gasworks produced tar as a byproduct, and Engelhorn used this for the production of dyes. BASF was set up in 1865 to produce other chemicals necessary for dye production, notably soda and acids. The plant, however, was erected on the other side of the Rhine river at Ludwigshafen, because the town council of Mannheim was afraid that the air pollution from the chemical plant could bother the inhabitants of the town. In 1866, the dye production processes were also moved to the BASF site. The discovery in 1857 by William Henry Perkin that aniline could be used to make intense colouring agents had led to the commercial production of synthetic dyes in England from aniline extracted from coal tar. BASF recruited Heinrich Caro, a German chemist with experience of the dyestuffs industry in England, to be the first head of research. Caro developed a synthesis for alizarin (a natural pigment in madder), and applied for a British patent on 25 June 1869. Coincidentally, Perkin applied for a virtually identical patent on 26 June 1869, and the two companies came to a mutual commercial agreement about the process. Further patents were granted for the synthesis of methylene blue and eosin, and in 1880, research began to try to find a synthetic process for indigo dye, though this was not successfully brought to the market until 1897. In 1901, some 80% of the BASF production was dyestuffs. Sodium carbonate (soda) was produced by the Leblanc process until 1880 when the much cheaper Solvay process became available. BASF ceased to make its own and bought it from the Solvay company thereafter. Sulfuric acid was initially produced by the lead chamber process, but in 1890, a unit using the contact process was brought on stream, producing the acid at higher concentration (98% instead of 80%) and a lower cost. This development followed extensive research and development by Rudolf Knietsch, for which he received the Liebig Medal in 1904. The development of the Haber process from 1908 to 1912 made it possible to synthesize ammonia (a major industrial chemical as the primary source of nitrogen), and, after acquiring exclusive rights to the process, in 1913 BASF started a new production plant in Oppau, adding fertilizers to its product range. BASF also acquired and began mining anhydrite for gypsum at the Kohnstein in 1917. In 1916, BASF started operations at a new site in Leuna, where explosives were produced during the First World War. On 21 September 1921, an explosion occurred in Oppau, killing 565 people. The Oppau explosion was the biggest industrial accident in German history. Under the leadership of Carl Bosch - a critic of Nazi policies - BASF founded IG Farben with Hoechst, Bayer, and three other companies, thus losing its independence. BASF was the nominal survivor, as all shares were exchanged for BASF shares prior to the merger. Rubber, fuels, and coatings were added to the range of products. Following the appointment of Adolf Hitler as Chancellor in 1933, IG Farben collaborated with the Nazi regime, profiting from guaranteed volumes and prices, and from the slave labor provided by the government's Nazi concentration camps. IG Farben also achieved notoriety owing to its production of Zyklon-B, the lethal gas used to murder prisoners in German Nazi extermination camps. In 1935, IG Farben and AEG presented the magnetophon – the first tape recorder – at the Radio Exhibition in Berlin. The Ludwigshafen site was almost completely destroyed during the Second World War and was subsequently rebuilt. The allies dissolved IG Farben in November 1945. Both the Ludwigshafen and Oppau plants were of strategic importance for the war because the German military needed many of their products, e.g., synthetic rubber and gasoline. As a result, they were major targets for air raids. Throughout the war, Allied bombers attacked the plants 65 times. Shelling took place from the autumn of 1943 and saturation bombing inflicted extensive damage. Production virtually stopped by the end of 1944. Due to a shortage of male workers during the war, women were conscripted to work in the factories, and later prisoners of war and foreign civilians. Concentration camp inmates did not work at the Ludwigshafen and Oppau plants. In July 1945, the American military administration confiscated the entire assets of IG Farben. That same year, the Allied Commission decreed that IG Farben should be dissolved. The sites at Ludwigshafen and Oppau were controlled by French authorities. On 28 July 1948, an explosion occurred at a BASF site in Ludwigshafen, killing 207 people and injuring 3818. In 1952, BASF was refounded under its own name following the efforts of former Nazi Party member and Third Reich Wehrwirtschaftsführer (war economy leader) Carl Wurster. With the German economic miracle in the 1950s, BASF added synthetics such as nylon to its product range. BASF developed polystyrene in the 1930s and invented Styropor in 1951. In the 1960s, production abroad was expanded and plants were built in Argentina, Australia, Belgium, Brazil, France, India, Italy, Japan, Mexico, Spain, United Kingdom and the United States. Following a change in corporate strategy in 1965, greater emphasis was placed on higher-value products such as coatings, pharmaceuticals, pesticides and fertilizers. 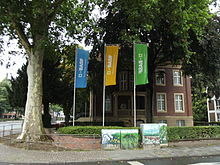 Following German reunification, BASF acquired a site in Schwarzheide, eastern Germany, on 25 October 1990. It expanded to Podolsk, Russia, in 2012, and to Kazan in 2013. In 1968 BASF (together with Bayer AG) bought the German coatings company Herbol. BASF completely took over the Herbol branches in Cologne and Würzburg in 1970. Under new management, the renewal and expansion of the trademark continued. After an extensive reorganisation and an increasing international orientation of the coatings business, Herbol became part of the new founded Deco GmbH in 1997. BASF bought the Wyandotte Chemical Company, and its Geismar, Louisiana chemical plant in the early 1980s. The plant produced plastics, herbicides, and antifreeze. BASF soon tried to operate union-free, having already reduced or eliminated union membership in several other US plants. Challenging the Geismar OCAW union resulted in a labor dispute that saw members locked out from 1984-1989 and eventually winning their case. A worker solidarity committee at BASF's headquarters plant in Ludwigshafen, Germany, took donations from German workers to support the American strikers and organized rallies and publicity in support. The dispute was the subject of an academic study The union also exposed major accidental releases of phosgene, toluene and other toxic gases, these being publicized in the local media and through a video, Out of Control. A court threw out a $66,700 fine against BASF for five environmental violations as "too small". BASF's European coatings business was taken over by AkzoNobel in 1999. BASF bought the Engelhard Corporation for $4.8 billion in 2006. Other acquisitions in 2006 were the purchase of Johnson Polymer and the construction chemicals business of Degussa. BASF Portsmouth Site in the West Norfolk area of Portsmouth, Virginia, United States. The plant is served by the Commonwealth Railway. The acquisition of Degussa AG's construction chemicals business was completed in 2006. The purchase price for equity was about €2.2 billion. In addition, the transaction was associated with a debt of €500 million. In October 2017, BASF announced it would buy seed and herbicide businesses from Bayer for €5.9 billion ($7 billion), as part of its acquisition of Monsanto. For the fiscal year 2017, BASF reported earnings of EUR€6.1 billion, with an annual revenue of EUR€64.5 billion, an increase of 12% over the previous fiscal cycle. BASF's shares traded at over €69 per share, and its market capitalization was valued at US€63.7 billion in November 2018. BASF operates in a variety of markets. Its business is organized in the segments of Chemicals, Plastics, Performance Products, Functional Solutions, Agricultural Solutions, and Oil & Gas. BASF produces a wide range of chemicals, for example, solvents, amines, resins, glues, electronic-grade chemicals, industrial gases, basic petrochemicals, and inorganic chemicals. The most important customers for this segment are the pharmaceutical, construction, textile, and automotive industries. BASF's plastic products include high-performance materials in thermoplastics, foams, and urethanes. BASF's Engineering Plastics consists of the "4 Ultras" - Ultramid polyamide (PA) nylon-based resins, Ultradur, polybutylene terephthalate (PBT), Ultraform, polyacetal (POM), and Ultrason, polysulfone (PSU) and polyethersulfone (PES). BASF Styrenics consists of the Foams and Copolymers. BASF's styrenic copolymers have applications in electronics, building and construction, and automotive components. In 2011 BASF and INEOS blended their global business activities in the fields of styrene monomers (SM), polystyrene (PS), acrylonitrile butadiene styrene (ABS), styrene butadiene copolymers (SBC) and other styrene-based copolymers (SAN, AMSAN, ASA, MABS) into a joint venture named Styrolution. BASF's Polyurethanes business consists of diverse technologies and finished products. Urethane chemicals are raw materials used in rigid and flexible foams commonly used for insulation in the construction and appliance industries, furniture, packaging, and transportation. Foams like Styropor are generally used as insulating materials. They are eco-efficient and offer advantages over other materials in terms of cost-effectiveness, preservation of resources and environmental protection. Investments made for insulating materials usually pay for themselves within a short time and contribute to retaining and even enhancing the value of buildings. BASF manufactures polyamide precursors and polyamide. BASF developed a biodegradable plastic with a high content of polylactic acid. BASF produces a range of performance chemicals, coatings and functional polymers. These include raw materials for detergents, textile and leather chemicals, pigments and raw materials for adhesives, paper chemicals. Customers are the automotive, oil, paper, packaging, textile, sanitary products, detergents, construction materials, coatings, printing, and leather industries. BASF's Functional Solutions segment consists of the Catalysts, Construction Chemicals and Coatings divisions. These divisions develop innovative, customer-specific products and system solutions, in particular for the automotive and construction industries. BASF supplies agricultural products and chemicals including fungicides, herbicides, insecticides and seed treatment products. The company also researches nutrigenomics. BASF opened a new crop protection technology center in Limburgerhof, Germany in 2016. BASF is cooperating with Monsanto Company in research, development and marketing of biotechnology. The BASF Plant Science subsidiary produces the Amflora and Starch Potato genetically modified potato with reduced amylose. In 2010 BASF conducted Department of Environment, Food and Rural Affairs approved trials of genetically modified potatoes in the United Kingdom. Starch Potato was authorised for use in USA in 2014. Other GM crops are Phytaseed Canola varieties with phytase, sulfonylurea herbicide tolerant soybean and drought tolerant corn (with cold shock protein B) developed with Monsanto. BASF explores for and produces oil and gas through its subsidiary Wintershall Holding AG. In Central and Eastern Europe, Wintershall works with its Russian partner Gazprom. 75% of the BASF shares are held by institutional investors (BlackRock more than 5%). 36% of the shares are held in Germany, 11% in the UK and 17% in the U.S.
Ludwigshafen production site at night. BASF's recent success is characterized by a focus on creating resource efficient product lines after completely abandoning consumer products. This strategy was reflected in production by a re-focus towards integrated production sites. The largest such integrated production site is located in Ludwigshafen employing 33,000 people. Integrated production sites are characterized by co-location of a large number of individual production lines (producing a specific chemical), which share an interconnected material flow. Piping is used ubiquitously for volume materials. All production lines use common raw material sourcing and feed back waste resources, which can be used elsewhere (e.g. steam of various temperatures, sulfuric acid, carbon monoxide). The economic incentive for this approach is high resource and energy efficiency of the overall process, reduced shipping cost and associated reduced risk of accidents. Due to the high cost of such an integrated production site, it establishes a high entry barrier for competitors trying to enter the market for volume chemicals. BASF built a new chemical complex in Dahej, Gujarat at a cost of $100 million. This facility has South Asia's first methylene diphenyl diisocyanate (MDI) splitter for processing crude MDI. BASF has 8 production facilities in India. BASF SE has succeeded in developing a semi-crystalline polyamide that allows light to pass through largely unhindered. Ultramid Vision combines very high light transmission with low light scattering. This makes it the world’s first semi-crystalline polyamide for semi-transparent or transparent components in chemically challenging environments. Additionally, the unique polyamide is UV and temperature resistant, scratch-proof as well as suitable for flame-retardant requirements. Ultramid Vision can be used in various application fields: It recommends itself especially for parts for visual check, illumination or light design. Ultramid Vision presents a versatile alternative to commonly used materials such as amorphous aliphatic polyamides, polycarbonate or styrene-acrylonitrile copolymers. In 2006 BASF was included in the Climate Leadership Index for their efforts in relation to climate change and greenhouse gas emissions. The BASF Company and Columbia University formed a partnership to further research “environmentally benign and sustainable energy sources”. The company has recently reported their emissions in 2006 to be “1.50 million metric tons of waste,” which is a decrease from previous years. The amount of waste BASF produces has continued to fall. While BASF publishes its environmental information in the US and Europe, Greenpeace has expressed deep concerns at BASF's refusal to release environmental information on its operations in China. In May 2009, a BASF Plant in Hannibal, Missouri, United States, accidentally discharged chromium into the Mississippi River. The local Department of Natural Resources performed tests in December 2009 showing the chromium levels did not exceed regulatory safety limits. BASF worked with the Missouri Department of Natural Resources (MoDNR) to resolve questions regarding the elevated level of hexavalent chromium that was detected in the effluent from one of its permitted outfalls into the Mississippi River. The state department of health reviewed the test results and determined that the amounts found were well below recommended public health screening levels. In 2013, BASF reported a spill of several hundred kilograms of the chelating agent Trilon-B (tetrasodium EDTA) into the river Rhine from BASF's headquarters in Ludwigshafen, Germany. ^ a b c d e f "Annual Report 2018" (PDF). Retrieved 15 March 2019. ^ "BASF Headquarters". BASF. Archived from the original on 2 June 2017. Retrieved 26 February 2016. ^ "Who Are The World's Largest Chemical Producing Companies?". World Atlas. Retrieved 25 October 2017. ^ "Largest chemical companies worldwide based on revenue in 2017 (in billion U.S. dollars)". Statista. Retrieved 25 October 2017. ^ "Börse Frankfurt (Frankfurt Stock Exchange): Stock market quotes, charts and news". Retrieved 3 February 2016. ^ "European shares drop after weak BASF and Novartis updates". Reuters. Retrieved 25 October 2017. ^ a b c d e W. Ludewig (1966) Trans Inst Chem Engrs vol 44 ppT237-252 "Highlights in the History of BASF"
^ "1865-1901: The Birth of the Chemical Industry and the Era of Dyes". BASF. Archived from the original on 13 March 2017. Retrieved 25 June 2017. ^ Ordway, Frederick I, III; Sharpe, Mitchell R (1979). The Rocket Team. Apogee Books Space Series 36. pp. 75, 76, 79, 88. ^ "IG Farben to be dissolved". BBC News - Business. BBC News. 17 September 2001. Retrieved 9 May 2008. ^ "Carl Wurster (1900–1974)". Wollheim Memorial. Retrieved 3 February 2016. ^ "BASF opens production facility for concrete admixtures in Kazan, Russia". BASF. 17 September 2013. Archived from the original on 21 September 2013. Retrieved 21 September 2013. ^ markdcatlin (28 April 2018). "Out of Control OCAW 1990". Retrieved 28 August 2018 – via YouTube. ^ Kuehnen, Eva (15 September 2008). "BASF bids $3 bln for Switzerland's Ciba". Reuters. Retrieved 15 September 2008. ^ "EU mergers and takeovers (March 6)". Reuters. 6 March 2009. Retrieved 6 March 2009. ^ "British business press". Financial Mail. South Africa. Reuters. 18 March 2007. Rat Poisoner Sorex is For Sale. Retrieved 2 October 2009 – via Reuters Press Digest. ^ Ludwig Burger (7 May 2015). "Siegfried buys BASF drug ingredient businesses for $306 million". Reuters. Retrieved 7 May 2015. ^ "BASF Bilanz, Gewinn und Umsatz | BASF Geschäftsbericht | BASF11". wallstreet-online.de. Retrieved 5 November 2018. ^ "BAS.DE Key Statistics | BASF SE NA O.N. Stock - Yahoo Finance". finance.yahoo.com. Retrieved 5 November 2018. ^ "BASF Plastics Portal - Global Homepage". Retrieved 3 February 2016. ^ "EU Commission approves formation of joint venture Styrolution". Messe Düsseldorf GmbH. 13 June 2011. Archived from the original on 15 May 2012. Retrieved 25 June 2017. ^ Wallace, Helen (January 2006). "Your Diet Tailored to Your Genes: Preventing Diseases or Misleading Marketing?" (PDF). GeneWatch UK. Archived (PDF) from the original on 30 May 2008. Retrieved 9 May 2008. ^ "BASF opens crop protection technology center in Germany". WorldOfChemicals. 23 September 2016. Retrieved 23 February 2016. ^ BASF SE. "BASF-Gruppe: Interview Dr. Jürgen Hambrecht zur Zusammenarbeit mit Monsanto". Retrieved 3 February 2016. ^ "EH92-527-1 - GM Approval Database". ISAAA. Archived from the original on 25 April 2015. Retrieved 25 June 2017. ^ a b "AM04-1020 - GM Approval Database". ISAAA. Archived from the original on 25 April 2015. Retrieved 25 June 2017. ^ "GM Crop Events developed by BASF - GM Approval Database". ISAAA. Archived from the original on 16 March 2013. Retrieved 25 June 2017. ^ Press Trust of India (8 October 2014). "BASF India invests Rs 1,000 cr in Guj chemical complex". Retrieved 3 February 2016. ^ "BASF develops first semi-crystalline polyamide, Ultramid Vision". WorldOfChemicals. 13 October 2017. Retrieved 17 October 2017. ^ "BASF's environmental efforts recognized". Evertiq. 25 September 2006. Archived from the original on 15 March 2016. Retrieved 3 February 2016. ^ "BASF: the bad boy in China?". Greenpeace East Asia. Retrieved 3 February 2016. ^ Maguire, Kim; Messenger, Tony (8 January 2010). "New tests find higher level of chemical Hannibal water results prompt questions about state's disclosure delay". St. Louis Post-Dispatch. Retrieved 3 February 2016. ^ Henley, Danny (12 February 2010). "BPW: Chromium-6 findings require no water treatment changes" Archived 23 July 2011 at the Wayback Machine. Hannibal Courier-Post. Retrieved 9 March 2010. ^ "Chemical Product Spill at BASF – 600 kg Trilon B Leaked into Rhine River". Retrieved 3 February 2016. Wikimedia Commons has media related to BASF.